Mill Creek Police SUV. Photo credit: Lesley Van Winkle. 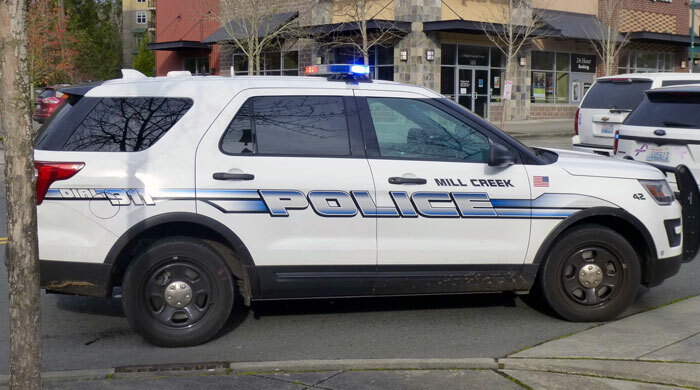 According to the latest Mill Creek Police Blotter, a total of 358 responses were reported the week of April 5 to April 11, 2019. 06:31:44 - 15600 BLK BOTHELL EVERETT HWY: Officers took a report regarding a hit and run collision that occurred near the 15600 block of Bothell‐Everett Hwy. 23:22:28 - 13500 BLK NORTH CREEK DR: Police responded to a domestic assault in the 13500 block of North Creek Drive. Subsequent to investigation, a 31 year old male was arrested and booked into Snohomish County Jail for Assault 4th degree, Malicious Mischief 3rd degree, and 2 misdemeanor warrants for his arrest. 08:09:20 - 15600 BLK MAIN ST: An abandoned bicycle was found in the 15600 block of Main ST.
12:02:53 - 15728 MAIN ST: Officers located an item of found property in the 15700 block of Main St. The item was submitted into evidence. 19:30:42 - 14500 BLK NORTH CREEK DR: Police responded to a domestic disturbance in the 14500 block of North Creek Drive. Subsequent to investigation and, after careful consideration that no crime occurred, a report was taken. 14:34:09 - 600 BLK 128TH ST SE: Officers observed a vehicle near the 600 block of 128 St SE. Officers discovered that a fugitive was associated with the vehicle and witnesses observed him running through McCollum Park. With the assistance of Snohomish County Deputies and an Everett PD K9 unit, a manhunt ensued and the fugitive was apprehended after an extensive search. The subject was booked into the SC Jail and he may face additional charges for violating a DV No Contact Order. 21:42:21 - 1000 BLK 164TH ST SE: A 26 year old female was arrested near the 1000 block of 164th for possession of narcotics. 01:32:22 - 4400 BLK 132ND ST SE: Police observed a warrant subject driving a vehicle near the 4400 block of 132nd Street SE. The vehicle was subsequently stopped and the driver arrested on several warrants as well as for driving with a suspended license. 10:43:03 - 2000 BLK 132ND ST SE: An individual was reported shoplifting in the 2000 block of 132nd ST SE. The merchandise was immediately recovered. 01:36:33 - 900 BLK 164TH ST SW: Officers stopped a vehicle for a defective brake light in the 700 block of 164th St SW. A 29 year old Lynnwood male was arrested and booked into the Snohomish County Jail for DUI. 03:16:23 - 14700 BLK MAIN ST: An officer responded to a report of a vehicle prowl in the 14700 block of Main St. A suspect was seen smashing windows on a work van, however, they left the area prior to police arrival. Officers were unable to locate the owner of the vehicle. Follow‐up is required. 07:53:16 - 14200 BLK 14TH CT SE: A resident in the 14200 block of 14th CT SE reported a theft from their home. 09:36:30 - 4400 BLK 132ND ST SE: A Mill Creek officer stopped a vehicle for a traffic infraction in the 4400 block of 132nd St SE. The driver was found to have a suspended driver's license and was referred to court. 09:47:46 - 3400 BLK 132ND ST SE: A robbery with a weapon was reported near the 3500 block of 132nd ST SE. Officers contacted several involved parties and vehicles, the investigation is ongoing. 12:08:07 - 15728 Main ST: A Mill Creek officer took a firearm for destruction at City Hall, 15728 Main Street. 15:07:26 - 15600 BLK FAIRWAY FOUNTAINS CT SE: Officers responded to a counter complaint regarding Identity Theft in the 15600 block of Fairway Fountains CT SE. A 31 year old Mill Creek woman reported a subject known to her used her banking information to fraudulently obtain her funds. 17:16:10 - 15900 BLK VILLAGE GREEN DR: Officers responded to a welfare check in the 15900 block of Village Green Dr. Upon making entry into the residence, officers found the homeowner deceased. Family was notified. 19:10:40 - 16400 BLK BOTHELL EVERETT HWY: Officers stopped a vehicle in the 900 block of 164th St SE for a registration violation. A 19 year old Mill Creek female was cited and released for DWLS 3rd Degree and Fail to Surrender Suspended License. 22:42:46 - 3900 BLK 141ST PL SE: Officers responded to the 3900 block of 141st Pl SE for a malicious mischief report. A 41 year old Mill Creek woman reported her window was smashed by a rock. A report was taken. 22:58:52 - 16300 BLK MILL CREEK BLVD: An officer responded to a report of a fraudulent $50 bill in the 16300 block of Mill Creek Blvd. An unknown male attempted to use a fake $50 to make a purchase but was unsuccessful. Follow‐up is required. 16:35:45 - 4200 BLK 132ND ST SE: Officers took a report regarding a vandalism incident which occurred near the 4200 block of 132 St SE. 05:07:39 - 13400 BLK DUMAS RD: Police responded to a cold vehicle prowl in the 13400 block of Dumas Road. Nothing of value was taken, and no clues or leads exist. A report was completed and submitted. 18:28:27 - 2000 BLK VILLAGE GREEN DR: An argument occurred between a teenage boy and girl near the 2000 block of Village Green Drive. Click on this link to see the April 5th to April 11th, 2019, Mill Creek Police Blotter.